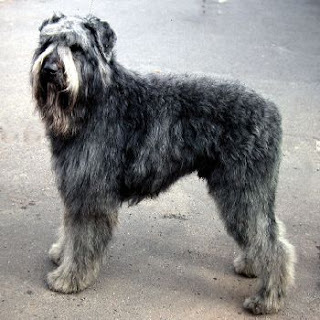 Bouvier Des Flandres breed may seem fierce but is quite calm and delicate in reality, at the same time it can be strong and courageous. It is a herding dog breed that was developed in Flanders and was initially used for farm work which included cattle droving, pulling of carts and herding of sheep, but these days this breed is kept as guard dogs or used in police department. They are smart and simple to train, and at the same time they are a good source of entertainment. Their life expectancy is 10 to 12 years. They are strong dogs and do not suffer from any major disease. However they are at a risk of hip dysplasia, and eye problems like cataracts. Moreover, they can bear a lot of pain which makes it difficult for the veterinarians to figure out where its hurting.